Shirley Williams who has died aged 71. Tributes have today been paid to a community stalwart and campaigner described as a “saint” who has died following a battle with cancer. Shirley Williams, 71, devoted much of her life to helping others in Sunderland and in particular the East End of the city where she lived. Despite being diagnosed with Polio at the age of just a year and three months which required surgery, Ford Estate-born Shirley, a staunch supporter of the Labour Party, went on to have to two children and work in various jobs including at Vaux Brewery, Janet Frazer and Brians Mills. In 1977 she began working at the East End Community Centre before moving onto the area’s Citizens Rights Centre, helping people with housing and benefits issues. 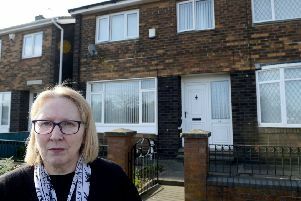 In later life despite being diagnosed with breast cancer in the early 2000s, Shirley went on to campaign on a number of community issues, including opposing the closure of Sunderland’s central fire station and also against the closure of Sunderland Royal Hospital’s Breast Cancer Unit in 2014. By 2016, following the creation of the Save Our Service group by Shirley and others, a new breast cancer fast track service had been opened at Grindon Primary Care Clinic in the city, carrying out mammogram, ultrasound and biopsy. Shirley Williams, left, with other members of the Save Our Service campaign group, second left Linda Lynas breast cancer patient, Lilian Lawson secretary, Norma Black breast cancer patient. In recent years she was recognised by the British Polio Fellowship and became a Paul Harris Fellow after being nominated by the Rotary Club. Shirley passed away on January 16 at Sunderland Royal Hospital, surrounded by her loved ones. Shirley’s husband of the past 12 years Gerry, 62, told the Echo: “She worked so much for the community and so tirelessly for people. “Despite all of her own health problems she never gave up on supporting other people who needed help. “Even when she was very ill and the doctors told us she only had a day left, she never complained or said ‘why has this happened to me?’. Alastair Tinto, a colleague of Shirley’s from the Citizens Rights Centre, said: “It’s hard to believe that Shirley has gone. “Sunderland has lost someone very special, a saint. Shirley leaves Gerry, sons Darren and Anthony, daughter-in-law Helen as well as granddaughters Beth and Gemma. Her funeral will take place Sunderland Minster on Wednesday, January 30, at 1.30pm followed by burial at Bishopwearmouth Cemetery. Flowers and donations should given to the cancer centre at Sunderland Royal Hospital.